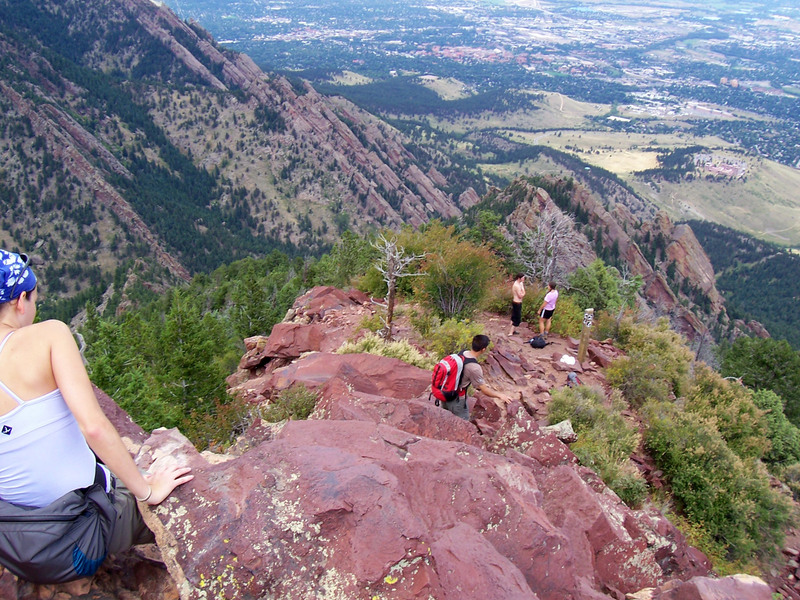 Backpacker magazine: "Bag three peaks and bird's-eye views of Boulder on this tour of the Flatirons. Bring a few extra energy bars: This strenuous out-and-back gains over 5,000 feet in 11 miles." 1 (Mile 0): Start half-way up Flagstaff Rd where there's a road branching off to the right and left, a parking area on the left, and a gate blocking part of the road to the left. Head south down the dirt road, going right through the gate. 2 (Mile .2): R @ 3-way junction with Long Canyon Trail. 3 (Mile .4): L @ Y on Ranger Trail; old stone cabin with picnic benches. 4 (Mile .8): R @ Y on Ranger Trail at junction with Greenman Trail. 5 (Mile 1.4): First views of Boulder from open ridge. 6 (Mile 1.7): L @ 4-way; climb sharply to Green Mtn. summit. 7 (Mile 1.9): Views of Longs Peak and 20 other giants from Green Mtn. (8,053 ft.); check out peak finder atop summit log cairn; return to 4-way, go L onto Green Bear Trail. 8 (Mile 3): R @ 3-way onto Bear Peak West Ridge Trail; only water on route. 9 (Mile 4.9): L @ T for short, steep climb to Bear Peak. 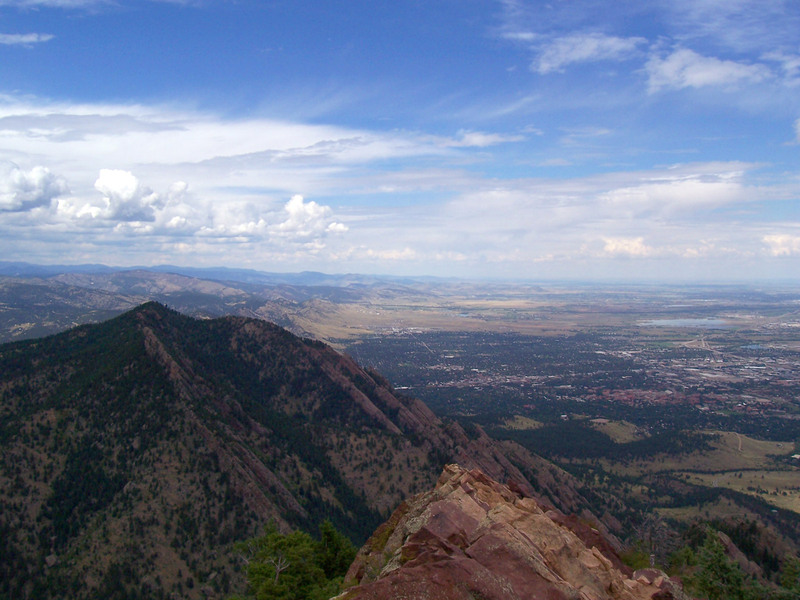 10 (Mile 5): Summit of Bear Peak (8,461 ft.); views of Denver and Rocky Mtn. NP; return to waypoint 9, go L.
11 (Mile 5.5): Straight @ 3-way junction with Shadow Canyon Trail. 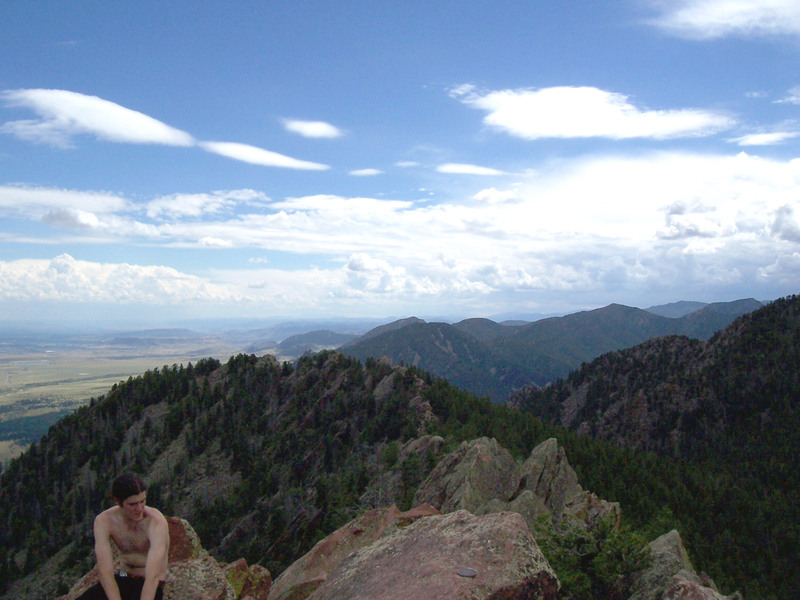 12 (Mile 5.8): South Boulder Peak (8,549 ft.); most dramatic and quietest summit; lots of raspberries; retrace route to car.